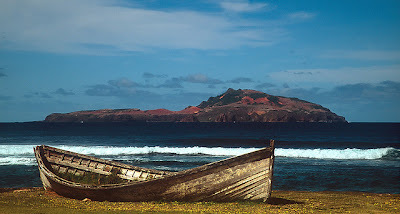 Phillip Island, as seen from Norfolk Island. Problems with soil erosion persist to this day, as evidenced by the red patches free of vegetation. In the southern Pacific Ocean, somewhere between Australia and New Zealand, lies Norfolk Island. In 1774, the HMS Resolution brought Captain James Cook to its shores, as part of his great voyage to discover the mythical southern continent Terra Australis. Cook and his men explored Norfolk island and two smaller offshore islands, Nepean and Phillip. Uninhabited and with sheer sea cliffs, Phillip Island in particular appeared lush, with dense scrub and forest growing in its rich volcanic soil. What secret wonders of nature were hidden in its valleys? Gone: the glory pea (Streblorrhiza speciosa). Austrian botanist Ferdinand Bauer visited Phillip Island (named in 1788 for Arthur Phillip, first Governor of New South Wales) in 1804 on a collecting trip. One of the plants he discovered was a striking new member of the bean family. 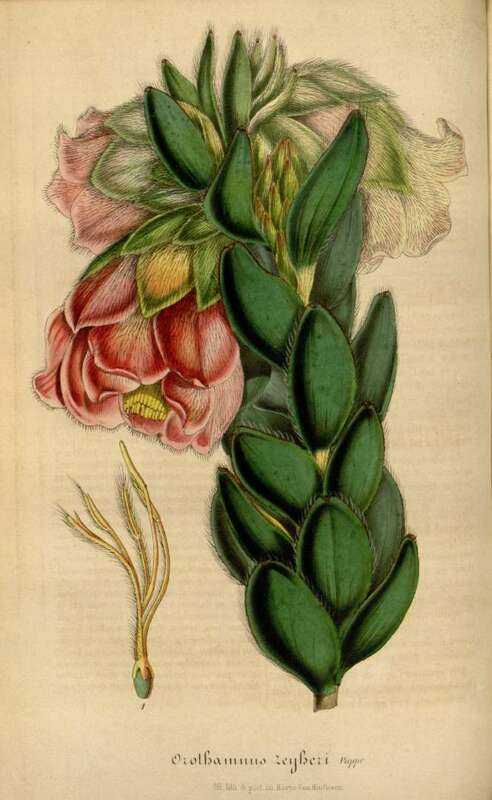 So unique was this plant that, upon receipt of Bauer's herbarium specimen back in Vienna, botanist Stephan Endlicher gave it its own genus, naming it Streblorrhiza speciosa. It quickly acquired the common name of glory pea: a scrambling woody vine, producing cascades of gorgeous pink blossoms. This was a plant that deserved to be grown by gardeners everywhere. Once introduced in Europe, the glory pea was an instant hit. Every nobleman with a conservatory wanted one. However, the glory pea proved quite difficult to grow well. Most gardeners kept it in pots in greenhouses. With its roots restricted by container gardening, instead of the deep volcanic earth of its island home, the glory pea flowered erratically. It gained a reputation as being intractable, and began to fall out of vogue.Why dedicate greenhouse space to something that promises a spectacle, but that you cannot get to flower? Within fifty years, no one was cultivating it any more. Which was such a big mistake. Back on Phillip Island, something was going disastrously wrong. On his 1830 collecting trip there, English explorer Allan Cunningham noted that the "vegetation was thin on top and there was severe gullying in the valleys". This was neither the lush island discovered by Cook, nor that so gleefully explored by Bauer. Naturally, there's an anthropological component to the decline of the island. For you see, in 1788 goats and pigs were introduced as food for the newly established penal colony on Norfolk Island. Rabbits soon followed, precipitating ecological disaster. Pretty soon, the overgrazing of Phillip Island became so severe that all the goats and pigs died from starvation. As can be seen from the photo above, the island is pretty much a desert to this day, plagued by soil erosion. It took until 1986 just to eradicate all the rabbits, and projects are currently underway to remove some introduced plant species as well. The long term goal is to restore the natural vegetation of Phillip Island to its former glory. But, tragically, without the glory pea. 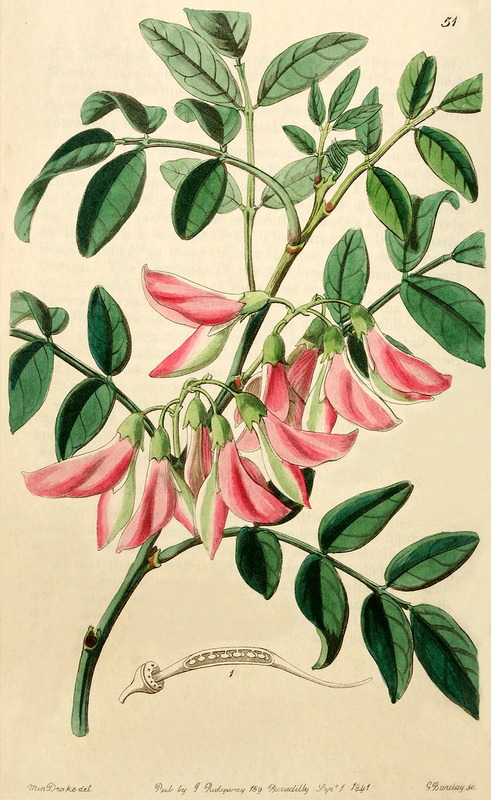 Researchers have made several attempts to find surviving specimens of Streblorrhiza speciosa still hidden in the valleys of Phillip Island, but to no avail—the glory pea is listed as extinct on the IUCN Red List. The botanical illustration above and a handful of dried herbarium specimens are all that remain now. If only those gardeners had known the value of ex situ conservation back then. If only they had realized that they could have saved the glory pea from oblivion. But perhaps, within the ancient walls of a palace garden outside of Vienna, or in the conservatory of a crumbling English manor house, someone had thought, Oh, might as well, and kept a specimen of the glory pea alive all these years. Hope lies dormant, like seeds buried deep in volcanic soil. Adderley Street Flower Market, early 20th century. One morning in 1847, German botanist Karl Zeyher stopped at Cape Town's Adderley Street Flower Market, like he often did. The flower sellers, as colourful as their wares, were only too eager to show him their latest finds, obtained on long and often dangerous expeditions into the rugged Cape Mountains. Among the bunches of proteas and irises blooming in deep buckets of water, Zeyher noticed something unusual, new. Well, new to science. Slender, woody stems covered in an armour of velvety leaves supported nodding, crimson blooms: it was the marsh rose. He managed to coax the secret of this splendid plant's location from the seller, who told Zeyher he had collected it from the mountainsides above what is now Pringle Bay. 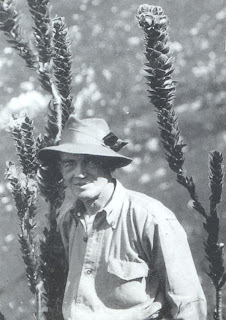 In due course, Zeyher located the plant and sent specimens back to Europe. Fellow German botanist, Karl Pappe, gave it the scientific epithet Orothamnus zeyheri, after his colleague. One could argue that it would have been more fitting to name the marsh rose for its original discoverer, but this was colonial South Africa, and botanists of colour, no matter how intrepid, were unlikely to see their names recorded in the annals of history. However, this wouldn't be the last time the flower merchants of Adderley Street would bring something special to the attention of science. The mountains of the Kogelberg Biosphere Reserve. T.P. Stokoe amongst the marsh roses. In 1911, Thomas Pearson Stokoe left his job and his wife and daughter behind in Sunderland, England, got on a ship, and arrived in Cape Town to start a new life as a lithographer for the Cape Times. Inevitably, he became enamoured of the wild places, exploring the mountains to look for new species whenever he could. Upon exploring the fynbos of the Cape Peninsula for the first time, he remarked, "I hesitated to trespass over what I thought was a private garden. Eventually I ventured forward and was thrilled at the sight of so much floral beauty." His desire to seek out novel plants would end up driving him into the hidden peaks and secret valleys of the Kogelberg, clear on the other side of False Bay. And what a place it is. The Kogelberg (Dutch for Cannonball Mountain) towers 1,265 m above the ocean, its ring of severe cliffs simply studded with unique plants. Today, the Kogelberg Biosphere Reserve (a UNESCO World Heritage Site) is home to some 1,600 plant species, of which about 150 are totally endemic to this part of the Cape Floristic Kingdom. The core 320 square kilometres of the reserve harbour more species richness than any other place on Earth of a similar size, including the dense rain forests of the tropics. It's enough to give heart palpitations to any biodiversity fan. Almost every valley and mountainside supports something unique that lives there and only there. Some plants have an entire range limited to a few square metres on a single mountain slope. This place is precious. This place is delicate. This place is magical. Even the genus Protea (the very quintessence of the fynbos biome) is named after Proteus, the ancient shape-shifting sea god. A place of fog and fire, it's easy to imagine the Kogelberg as the home of mythological creatures. In February 1922, somewhere in the Kogelberg range, Stokoe came across a single specimen of a very unusual and beautiful plant, a tall and elegant member of the protea family. 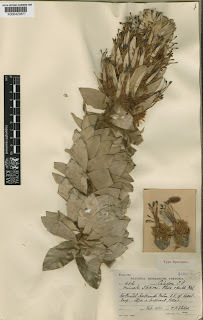 He collected flowering branches as herbarium specimens and sent them to the Royal Botanic Gardens at Kew, where it was described and named Mimetes stokoei, in his honour. Today, this plant is commonly known as the "mace pagoda". However, Stokoe himself always referred to it as his "golden protea". Whatever you'd prefer to call it, something weird was going on. Why was there only one plant on that hillside? Stokoe felt the mysterious and inaccessible Kogelberg, windswept, often wrapped in dense fog, calling out to him. He had to find another specimen. Subsequent collecting trips proved fruitless: it was like his golden protea had never existed at all. On 4 July 1925, Stokoe was perusing the wild flowers sold by the vendors in Adderley Street, when an old friend caught his eye. You guessed it: plunged into a deep bucket of water were the tall and elegant flowering stems of Mimetes stokoei. Stokoe bought the branches from the seller and proceeded to question her about their origins. The seller was less than forthcoming with the information: collecting sites were closely guarded secrets for people whose entire livelihoods depended on bringing the most exotic specimens to Adderley Street. Stokoe was relentless however, and after much persuasion, a deal was struck. With the merchant's supplier as his expert guide, Stokoe set off on an expedition into the Kogelberg range. In due course, the flower picker revealed to him a small stand of Mimetes stokoei, rising elegantly above the other vegetation. It was clear the mace pagoda was scarce; all told, Stokoe and his flower seller friends could only locate ten plants, in two small populations. What was more worrying, though, was that they were all old, mature plants, not seedlings. And it seemed that the plants were in trouble. Senescing. Withering. Dying. By 1959, Mimetes stokoei was listed as extinct. CapeNature huts in the high valley of the Kogelberg Biosphere Reserve. Marie Vogts, doyenne of proteas. The overexploitation of the Cape's vulnerable flora became a growing concern after World War II, and the Adderley Street merchants were no longer allowed to collect flowers from the wild outside of a stringent permit system. 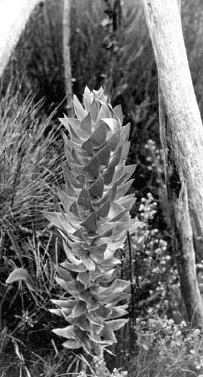 In the 1960s, the South African government endorsed active research in the horticultural potential of fynbos, and proteas in particular. 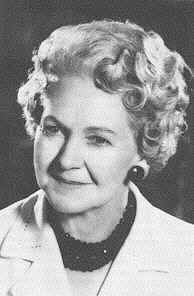 Instrumental in this movement towards horticulture as a form of conservation was Marie Vogts. Starting as a lecturer in Botany at the Paarl Teachers' College, she has written seminal works on growing proteas as garden plants and with her expertise and passion for Cape flora has done more to popularize fynbos than anyone. In 1960, she was appointed as a senior professional officer by the Department of Agriculture, and initiated plans for Oudebosch, an exciting experimental protea farm. It would be a permanent collection of horticulturally important species, and also a place of active scientific research. Vogts wanted to conduct transplant experiments: would proteas transplanted from the Cape Peninsula still flower at their regular time, or adapt to the flowering rhythms of their new home? In 1965, Vogts started developing Oudebosch in the high valley of the Palmiet River, deep in the Kogelberg. So how does one start a garden if there's already natural vegetation growing on the land, you may ask? In this case, the vegetation around the plots was clear-cut. Sometimes, however, it's easier just to burn it. In 1966, a weird weed sprouted in the Oudebosch nursery, right at the edge of a planting hole. Researchers realized with shock what it was: Mimetes stokoei, resurrected. The only mace pagoda in the entire world. The plant was beyond precious: here was an opportunity to obtain some seed, to save the species. A little protective wooden tripod was constructed around the seedling. This was a mistake. The Kogelberg is known for capricious weather: one morning after a fierce storm, the mace pagoda was found with a broken stem; high winds had snapped it against the very structure put up to protect it. It never even had a chance to flower. The year was 1969, and Mimetes stokoei was declared extinct all over again. So put yourself in Marie's shoes: you've managed to site your experimental farm right on top of the original location of the mace pagoda, all because the old botanists kept that location secret in their own attempt at conservation; clearing and trampling the site during construction of the nursery possibly doomed any other seedlings to oblivion; and when one still managed to sprout against the odds, it dies on your watch. You have such great passion for proteas and for nature conservation, yet in your preservation attempts you inadvertently cause the loss of the rarest one of all. Now: what do you feel? A terrible burden of responsibility? I certainly would, and I think Marie did, or at least accepted the criticism of her peers with good grace. In 1973, a new protea breeding program was started at Tygerhoek in the Overberg, 150 km from Cape Town, and the Oudebosch protea collection was moved there. The Kogelberg was transferred from the Department of Forestry to CapeNature in 1987 and declared a nature reserve. Marie Vogts passed away in 1998, one year before a devastating fire swept the Kogelberg. The fire that absolved her. 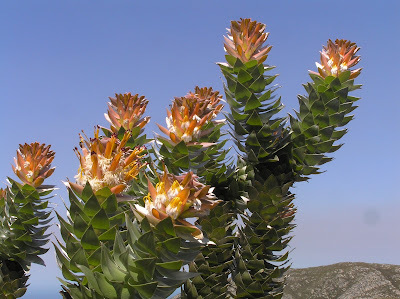 The mace pagoda, Mimetes stokoei, in bloom in the Kogelberg in March 2009. The March 2011 fire creeping across the Kogelberg. In December 1999, the Kogelberg Biosphere Reserve was engulfed in flames. Four days of hot dry winds fanned runaway blazes, resulting in more than half of the reserve being burnt to ash. However, fynbos has evolved to deal with fire, and exploit its capacity for clearing space and returning nutrients to the soil. Previous wildfires had occurred during winter; the summer monster of 1999 was much hotter. That made all the difference. For you see, Mimetes stokoei is a botanical phoenix, rising anew from its own ashes. It grows very rapidly, towering above the other fynbos, but it has a very short lifespan, perhaps ten years at most. This might explain why Stokoe saw plants that looked past their prime, back in the 1920s. This remarkable plant instead relies on its seedbank, buried in the earth by ants, to start a new generation of plants from scratch. It's as good as if your parents had to die before you could be born (for this analogy to work, pretend that humans lay eggs, okay?) and every generation lived out their entire lives in isolation. What would be a very strange life cycle for us makes sense for plants rooted to a landscape prone to frequent fires. The seeds of the mace pagoda have been lying dormant all this time, until a fire hot enough to awaken them arrived. The amazing thing is that the locality where Mimetes stokoei grows had likely not seen a superhot fire since the early 20th century. Disturbing the soil at Oudebosch during construction of the experimental farm only enabled one seedling to sprout; subsequent controlled burns of the site were never hot enough to awaken any others. But many dormant seeds were still present, under Marie Vogts' nursery, under her feet, waiting patiently. If only she'd known. In January 2001, reserve manager Mark Johns, out on a burn recovery inspection, noticed 24 unusual silver-leaved plants amongst the lush green post-fire vegetation of a hillside: Mimetes stokoei, the phoenix of the Cape, resurrected by the 1999 fire. The pagodas were growing strongly, rapidly: the first flowering occurred in 2004, with peak flowering reached in 2007. By 2009, the population already seemed to be in decline again, with only five plants left alive. With so much human activity, the incidence of fire in the Cape Floral Kingdom is on the rise. This is not a good thing. Fynbos species don't all deal well with frequent fires, most species instead thriving on a single hot inferno every 15 years or so. On 17 March 2011, a fire started alongside the road to the Bot River Estuary. Since the coastal sand flats are heavily infested with alien plants now, the fire rapidly blazed out of control, spreading into the high valleys of the Kogelberg. The tiny mace pagoda population got torched, and the regal flowers seen in 2009 are gone. For now: we know enough about the biology of Mimetes stokoei now not to call it extinct just because it is cycling between generations. The hottest flames will summon the fynbos phoenix. For much of the research in this story I am deeply indebted to the work of Peter Slingsby and Amida Johns. If you want to know more, purchase their scintillating and wonderfully illustrated biography of T.P. Stokoe here.